Have you heard the buzz? There is OVER $100,000 CASH up for grabs this April in un-BEE-livable real jackpot games. Buzz over to the main room from April 1st and until April 30th to play FOUR (4) weekly spelling Bee rounds! 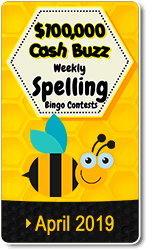 Be on the lookout and bingo on the ‘Spelling Bee’ contest patterns to be one of the first FIVE roomies to spell the words "SHOW ME THE MONEY” correctly during the contest period above to win EXTRA WEEKLY PRIZES. In addition to our weekly contest, we will also be offering a Buzz-worthy $1,000 CASH Grand Prize. Check out rankings and all details HERE. Get ready to spin and win! A new Season is here and we know how much you love Slot Tournaments! This is why we'll celebrate with 4 weekly tourneys with daily cash prizes to the lucky winners! Starting April 1st and until April 25st, join us from Monday to Thursday (EST time) for your chance to take part in a daily slot tourney. We'll give away $1,000 every week to the daily winners. Check rankings and details HERE. 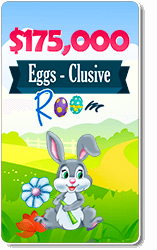 We’ve hidden Over $175,000 up for grabs and $35,000 in egg-citing GUARANTEED CASH JACKPOTS. Deposit, play, and win... it’s that easy. Join us every Friday to Sunday between 11:00 PM and midnight EST for a whole hour filled with incredible bingo fun and lots of cash to be won. We kick start the night with a $100BBS Golden Egg(s) FREEBIE GAME to give everyone in the room extra good luck as we play the $10,000, $5,000 and $2,500 Coveralls, followed by egg-citing themed $250-$500 multipart GUARANTEED SEED games with an additional buy-in % in return that will make jackpots grow. The more players join in the hunt, the higher the jackpots - No Jackpot Cap. (60 Cards MAX). All games play for a low cost of $0.50-$1 a card and a Buy 30 get 5 Free offer that guarantees you will have winning good time – Prebuy your cards or join the room at least 5 minutes before the event starts & hop away a winner! There's More. Everyone with a deposit made in the last 7 days will be entered to WIN EGG-XTRA PRIZES in our new WTG Wednesday Giveaways. (Every Bingo Card Purchase = 1 Raffle Ticket for the Following Wed Giveaway). This April we are giving you the chance to fill your Easter basket with lots of cash. Come search high and low for the hidden jackpots and see if you can find them all! – Buy tickets with BONUS money as well as cash and winnings. Winner(s) will be announced on Facebook. Players with 2 approved payouts over last 2 Wednesday do not qualify for extra prize offer(s). Deposit deal prizes may not be combined with any other extra dep deal offer. Prizes valid for 7 days after win (Wed - Wed EST). Combined Network Room - USD. Get ready cause we are making your Birthday month even more special! 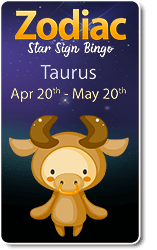 Join us for our new Zodiac Star Sign Bingo event each month to celebrate each star sign! Once a month we will be celebrating the new Start Sign with an EXCLUSIVE $200 FREE ROLL EVENT for all depositors in that specific star sign! We will also have a special Astrology pattern that matches the corresponding start sign of the month playing every night. If you bingo on the star sign pattern and it happens to be your Astrology sign as well, you can claim $15BBs from us! Play the incredible 3D Slots at AmigoBingo! 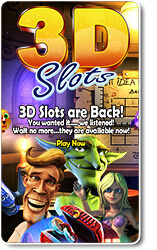 Play the astonishing 3D Slots featuring incredible bonus rounds, free spins and dozens of ways to win! Enjoy the 3D cinematic graphics and animations plus the wide range of themes designed to guarantee you hours and hours of fun! You'll be enchanted with the look and feel of these top notch machines, and most importantly you'll be surprised with the incredible jackpots that are there to be won. Start spinning now! Play Slots and Minigames with Bonus at AmigoBingo! 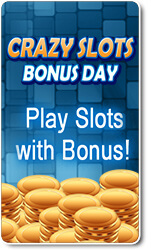 Choose your favorite Parlay Game and use your bonus EVERY day, 24/7! Because you asked for it! Play our famous Parlay Slots and Minigames with BONUS money as well as cash and winnings from Monday to Sunday! That's right, every day of the week!!! Have lots of fun this month using all your balances to spin any Parlay Slot and qualified minigames. This promotion is for a limited time only. Get the goods before they're gone. Good luck everyone! 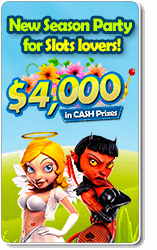 Only Parlay Slots and Minigames qualify to play with bonus. Mobislot, 3D Slots and any third party game don't qualify. Our normal wagering rules apply. Deposit in the present calendar week and AUTOMATICALLY be entered into our STRIKE IT LUCKY Depositor's Raffle at the end of each week this month. (Limited Time Offer). 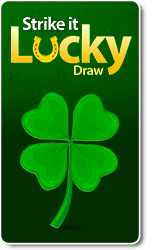 All tickets will be put into a "magic hat", the winning ticket will be randomly selected by an automated draw system among all depositors, so everyone with at least 1 raffle ticket has a fair chance to strike it lucky. The lucky winner will have the choice to pick one prize among five incredible options! How does winning free money sounds to you? 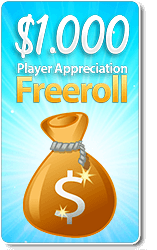 Our Player Appreciation FreeRoll returns this 2019 playing every week with a chance to win lots of free money while playing all your favorite games. Join in the Free Bingo fun and excitement every Wednesday at 7pm to play 10 FREE GUARANTEED GAMES, paying (3) $25 CASH, (7) 25BBs! That's Over $1,000 in cash and bingobucks PRIZES every month! To get an entry to this exclusive event you need to have deposited at least once over the last 7 days and not have any approved withdrawals since your deposit. You have until Tuesday at 11.59pm each week to make your deposit and qualify for this extravaganza of FREE MONEY! Prize: Over $1,000 in prizes every month! Don't miss your chance to win free prizes as there is nothing better than playing your favorite games and winning free money. Automatic free entry for players that have deposited at least once in the last 7days prior to each weekly Free Roll. Players can qualify by making a deposit by 6pm on the Wednesday before the event. Players with approved withdrawals in the last 7 days are not allowed to participate. Players must have made a deposit since an approved withdrawal in order to take part. Only players with a PO ratio of 90% and under qualify to participate. Must be present in room to take part in the event. 10 bingo games (3) $25 CASH, (7) 25BBs) will play starting at 7pm and then the room will automatically close. Are you a Team Player? Try Team Bingo! Just sign up and we'll place you in a team for a chance to win lots of Cash and Prizes every week. 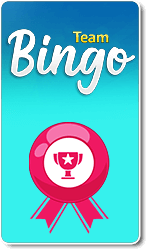 Team bingo is fantastic for bringing back that camaraderie of the old bingo days, helping you to get chatting and also earning EXTRA bingo bucks on the way. Team Bingo plays EVERY Saturday and Sunday between 5:00 and 7:00 PM. Must be registered by 4:00pm on the night of tourney. The Tournament room opens one hour prior to the tourney to get the party rolling. 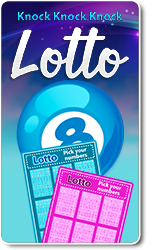 Any single $30 deposit that you make any day from Friday through Wednesday, will give you the chance to pick 5 lottery numbers. Once your deposit is made, enter your numbers RIGHT HERE, then head over to the main room at 2pm EST every Thursday to find out if you were among our lucky winners! Every week you can find the lucky winners on our blog! How about winning a big Jackpot today? At AmigoBingo we make it easy for you! Every day you have 2 great chances to win $1,000 or $750 CASH! Our Morning Coverall plays at 9am EST, it starts at 50 calls and every five days 1 call will be added increasing your chances to win! 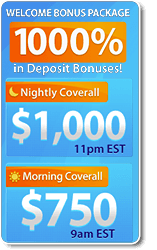 Our famous Nightly coverall will play at 11pm EST. It also starts at 50 calls and every three days calls will increase until a lucky player wins it! Guess what? if the jackpots dont go, there is a Minimum $100 CASH jackpot given away on each coverall, so players will never go empty handed! Good luck.